It's done and on its way to the almost new mom. 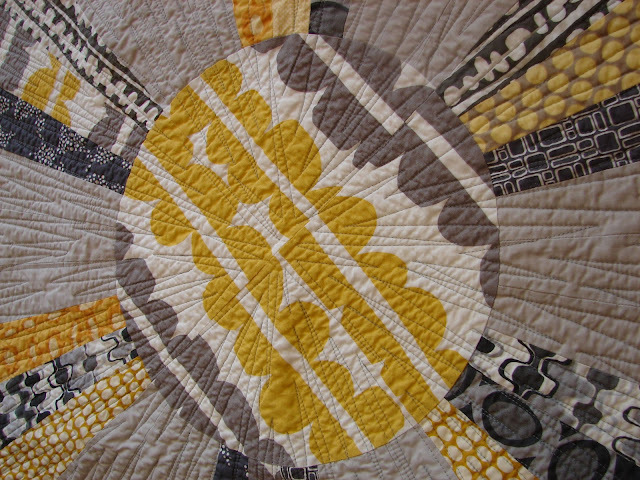 I quilted it in a sun ray motif that echoes out to the edge of the quilt. The first one forms a sun ray shape in the center and then I repeated it three more times around the quilt. It's easy to get lost on a round quilt when you're used to quilting squares and rectangles. I tried to keep the quilting consistent across the quilt (about the same distance apart). There are some areas I'm more happy with than others, but overall I think it's cute. And by the way...you young moms (and not so young moms) were so right about a circle being the perfect shape for a baby quilt. It is a swaddling dream! Even Yoda thinks so!! Thanks to my friend Rachel who came over and shot the photos for me, and it was her brilliant idea to use Yoda for a test swaddle. A bit much for a Jedi master, but he, like my son, was willing to forego his dignity for me. Have a wonderful Easter weekend. I'm heading to Kansas to celebrate Easter, my parent's anniversary, my dad's and my youngest son's birthdays and enjoy a weekend of rest and relaxation. I have much to celebrate! have a wonderful weekend jacquie! 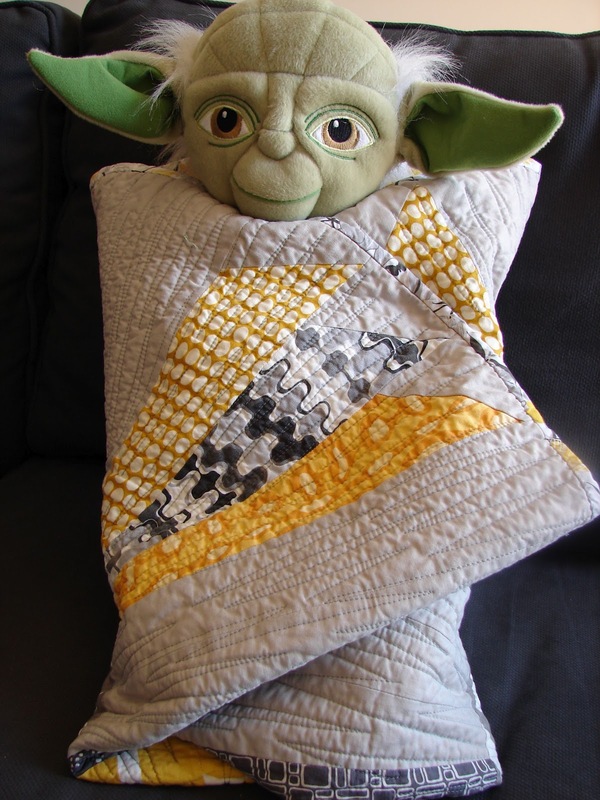 i love this quilt and yoda looks very very very happy! Have a wonderful weekend. What a cute quilt. I can testify to the effectiveness of swaddling babies and this looks perfect! P.S. I'll see you in K.C. next month! What a beautiful quilt - amazing quilting and such a fantastic present. Fabulous quilt! You know how I love circles. Have a wonderful relaxing Kansas weekend! This quilt is absolutely beautiful! I love everything about it. Ohhhh! Now I want a baby to swaddle! Beautiful and original quilt. And you're right ... perfect for swaddling! Sunshine rays---how clever!! Adore it. I love that quilt! My kids were cracking up at the picture of yoda-too cute! Amazing quilt!! LOVE the quilting :o) Have a great weekend celebrating! May you and Yoda enjoy your weekend celebrations! I love the colours in this. I am sure the new mom will love it! 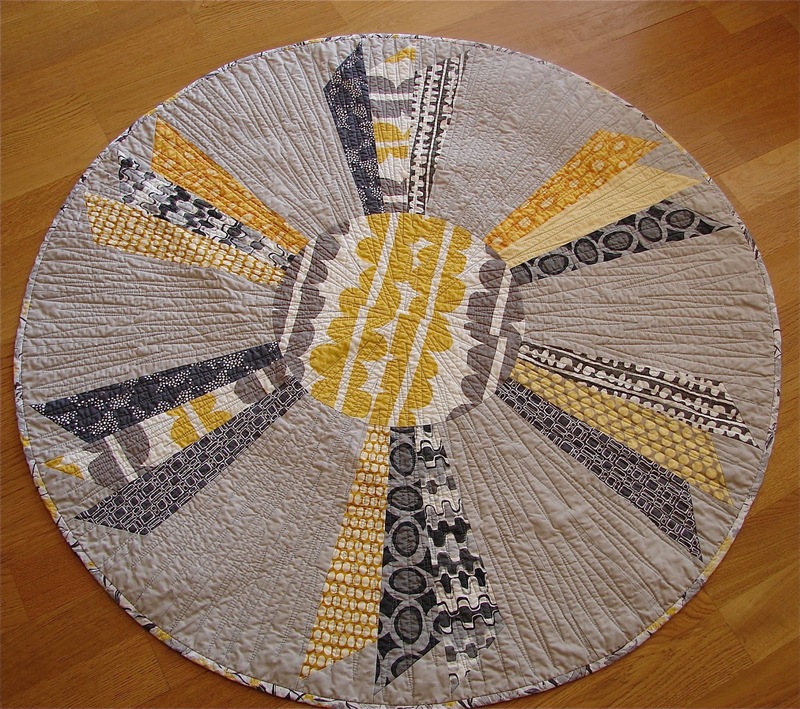 I have never thought about making a round baby quilt, but it makes perfect sense now! I love that you give away a lot of sunshine - great design! And I really like the quilting. I guess you need to take extra care with the binding on a round quilt, though, so you don't end up with a fabric bowl! Beautiful quilt ~ love the colors. Have a wonderful celebration with your family! I love this so much. So much! That's one lucky baby! Your quilt is so pretty! Happy Everything!...enjoy your time away. I love your little quilt! What a fantastic quilt! Like the name too! Never thought of a circle as a good swaddling blanket! It turned out great! I love the idea of a circle baby quilt and I'm glad you didn't end up changing your mind. Also I got my copy of APQ and I love the quilt!! I want that!! So cool and fun! Yummy Yoda in Yellow! Makes me smile just looking at it. New mom will fall in love with new baby quilt! Such a happy quilt...I love it. beautiful quilt. You are my sunshine was my sister's favorite song when we were little and if she has a baby I will definitely keep this in mind! Love your quilt especially the name. I used to sing the song to my oldest when he was a baby. Very cute! Have a great weekend! We have a new baby coming into our family too - I would love to make this quilt - is there a pattern? It turned out great! Lucky mom and baby. Yes, the quilting force is strong with you! Fabulous, I love the circle design. Wish I had thought of that back in the swaddling days, looks like it will make a nice, tight little baby bundle. This is wonderful! Happy Easter! I love it! What is the diameter of this? I've been scheming on what would be a special quilt for a pregnant friend and a circle quilt is sure to stand out. That is one beautiful quilt! 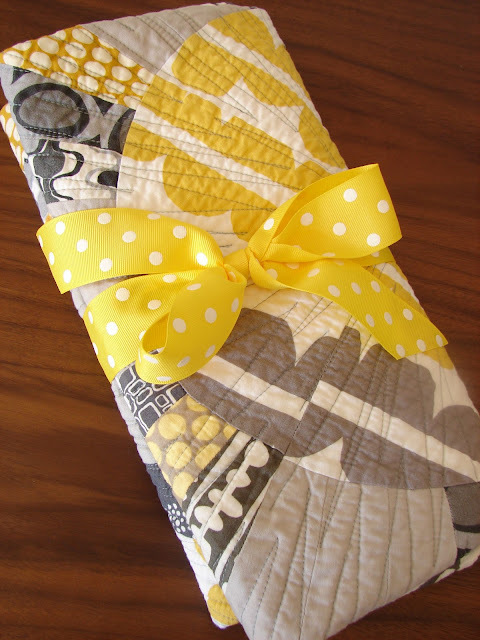 Your use of prints, colors and your quilting is fabulous!!! It turned out wonderful. Love it, right down to yoda. This quilt couldn't possibly be any more spectacular! It really is fabulous, and the new mom will surely love it! :) Great work as always! and that curtain that you inspired? This is beautiful!!! Any mom would *love* getting this! I expect nothing less than imaginative perfection from you!! Man I really love this quilt. I have never seen a round quilt before. So awesome great job. I love this quilt and I posted a link to it on my Facebook quilt page. Everyone adores it. One woman was asking what the diameter was so if you could answer me here or on the facebook page that would be great.